Have a wall in your home that makes you snooze? Sometimes we want a little more than paint to transform our walls. Try adding a stone or brick accent wall with these DIY projects and tutorials. Make the wall a focal point that has an upscale look, but can blend with almost any style or feel. You don’t have to hire a contractor either! From Kristin at ‘My Uncommon Slice of Suburbia‘, find her tutorial on DIY faux stone installation, indoors… I love how this really made this wall something special, and really sold the wine storage area… It really does look like a wine cellar! Lot’s of step by step photos! Learn how to install a DIY stone accent wall from ‘Paint Speckled Paw Prints‘… This is the perfect treatment for an entry area. It doesn’t have to cover a lot of square footage to make a big impact, especially when you first enter the home. They make it look easy! This next project is from Mandi at ‘Vintage Revivals‘. In her effort to add an industrial loft feel to her living room (great idea, BTW!) she shares her tutorial on how to install brick veneer. This totally transformed her already pretty darn cute living room! More on how to install brick veneer from ‘DIY Network‘… This is just another take on the same project, using a slightly different product. It’s always a good idea to read instructions from more than one source… You never know when you might come across that one tip that might make a difference in your brick accent wall! There is a company called Faux Panels that produces theses easy to install panels of faux stone, rock and brick in a lot of different configurations. Here is an example of a project done with their product. So much prettier! Air Stone produces a product that is sold at ‘Lowe’s’, and is used for a lot of the DIY stone accent wall projects you see. Check out their site for ideas, and more examples of real DIY projects people have completed using AirStone! We love this project from ‘Houzz‘, but it didn’t have a tutorial with it. So we found for you from ‘Instructables‘, here is how to build an indoor stone wall… This one is not a veneer project, they used real stones! Great if you want a more rustic look. This tutorial could be adapted to create the look in the ‘Houzz’ project below! Finally, from ‘Family Handyman‘, learn how to install stone veneer, complete with all the pro tips. We hope you are excited about using one of these Stone & Brick Accent Wall Projects! We think you will also love our post on Boost Your Homes Value with Easy DIY Projects and DIY Stair Railing Ideas! Previous Post Small Storage Sheds • Ideas & Projects! 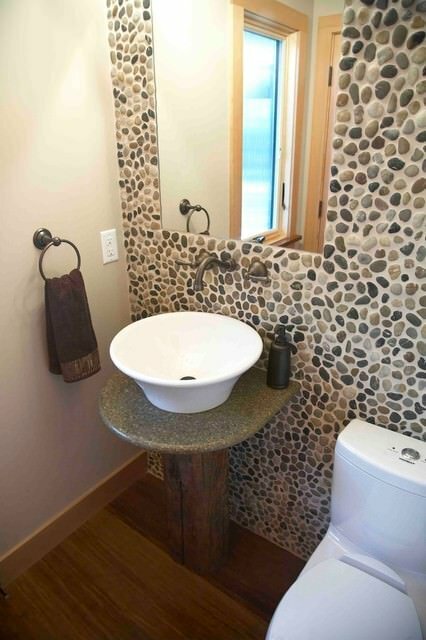 Could you do the pebbles over existing bathroom tile? Or does it have to be removed? I would think if you use the cement board like they did in the tutorial, you could go right over existing tile. But remember, you will have raised the level of the floor by placing it on top of existing flooring. Keep this in mind for clearance of doors, etc… Also, you will need to be able to screw the cement board down to the subfloor. Good luck! Can it be applied to a painted cement wall or does it have to be drywalled first? I was thinking this would be awesome for my basement. It is unfinished. When someone replies to you, can you post it? I’m interseted in the answer as well. Hi. Where can you buy the faux brick? Most building supply can order it for you. Omg, these are just the tutorials I need for when I stay remodeling my home!